This past April, an incredibly bright flash of light burst from near the constellation Leo. It has now been confirmed as the brightest gamma ray burst ever observed. 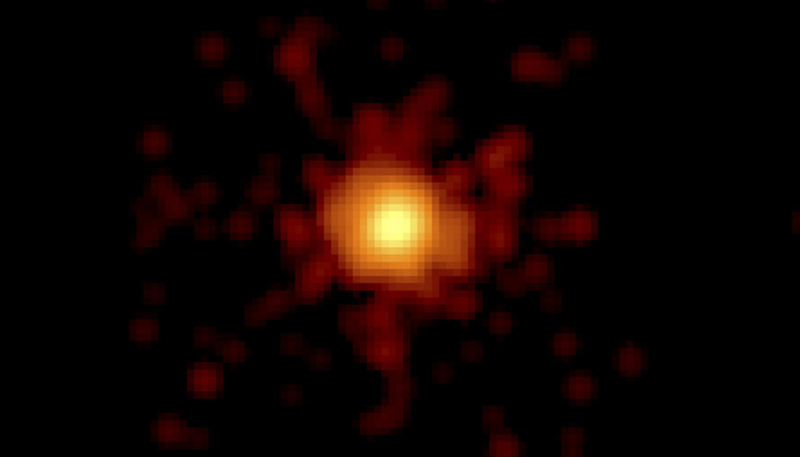 Named GRB 130427A, the blast was observed by several space- and ground-based telescopes, and the data was analyzed by dozens of astronomers around the world. The Fermi Gamma-ray Space Telescope was the first to detect the event, and it quickly began monitoring the flood of radiation using its Large Area Telescope (LAT), whose principal investigator is Peter Michelson, a physics professor at Stanford University and the SLAC National Accelerator Laboratory. Michelson leads the international collaboration that built and operates the LAT. Fermi’s quick action, allowing the LAT to record nearly the entire event, yielded incredible data that revealed previously unknown aspects of the mechanisms involved in a gamma ray burst. The findings are reported in a series of papers (paper #1, paper #2, and paper #3) published by the journal Science. Although details are not well understood, particles are accelerated at the shock front and, at the same time, interact with the surrounding electromagnetic fields. This causes particles to lose part of their energy emitting photons, through a process known as synchrotron radiation. 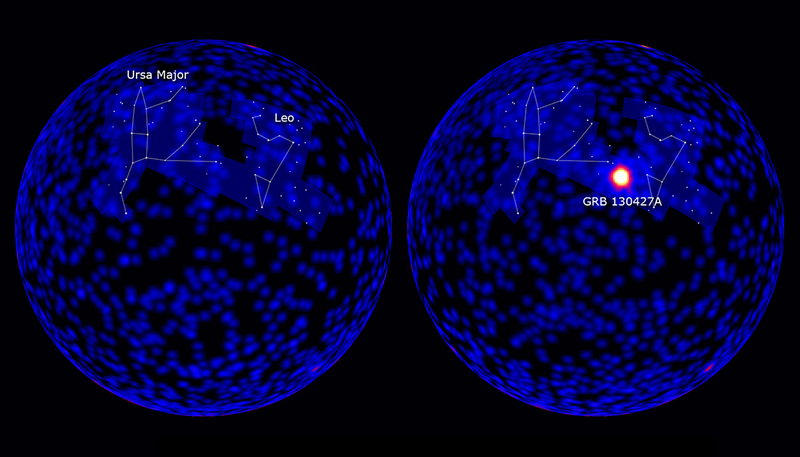 The observations of GRB 130427A, however, didn’t quite match energy levels predicted by these models. Additionally, the prevailing thought was that the brightest flashes were driven by the explosion’s internal shock waves, but the evidence indicates that these photons were created externally. The new observations don’t rule out the existing model, but researchers will need to either amend portions of it or adopt a new theory altogether to account for these characteristics, says Giacomo Vianello, a postdoctoral scholar in Michelson’s group and a co-author who performed LAT data analysis and interpretation on three of the Science papers. The microphysics of how particles are accelerated involves a certain amount of well-thought assumptions, and these assumptions therefore get built into the theoretical models used to predict the behavior of cosmic events. The assumptions are necessary in part because these events cannot be recreated in laboratory settings, he says, which highlights the critical role that observations play in the fine-tuning of fundamental physics theories. 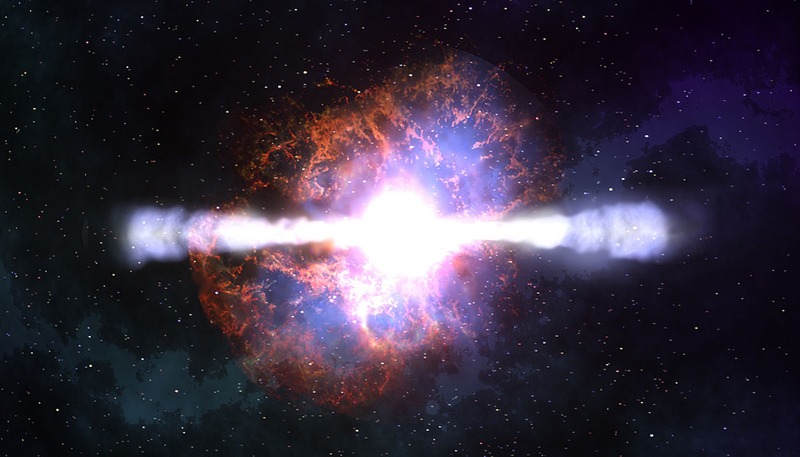 “The really cool thing about this GRB is that because the exploding matter was traveling at the speed of light, we were able to observe relativistic shocks,” Vianello explains. “We cannot make a relativistic shock in the lab, so we really don’t know what happens in it, and this is one of the main unknown assumptions in the model.